The market town of Burnley, in Lancashire has changed over the centuries. As a former mill town, Burnley used to be the largest producer of cotton cloths in the world in the 1880s. Then with the closure of the mills came engineering and the service sector, but through the change, the Burnley market has stood firm, trading for 700 years! Industry may have changed over the years in Burnley, but with change comes opportunity and by learning to drive in Burnley, it could be the start of great prospects and opportunities for you in the years ahead. 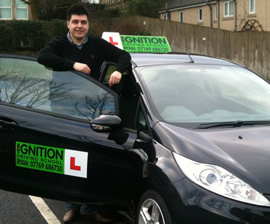 Ignition Driving School can help you with your goals of passing your driving test and equipping you with skills needed to be able to drive safely on Britain’s roads today. From single driving lessons to intensive style driving courses we can help you learn to drive, locally to you at times of the day that are most convenient for you. Ryan is a fab instructor and I couldn't have done it without him. He was so calm and patient, I was so nervous. I really appreciate it and will definitely be recommending to family and friends.